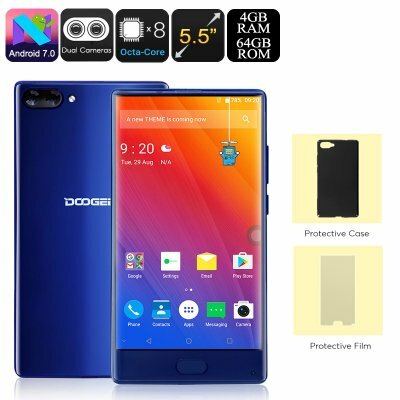 Successfully Added HK Warehouse Doogee Mix Android Phone - Octa-Core CPU, Android 7.0, 4GB RAM, Dual-IMEI, 5.5-Inch Small Bezel Display, 4G (Blue) to your Shopping Cart. Enjoy mobile media like never before on the 5.5-Inch bezel less display of the Doogee Mix Android smartphone. This stunning Android phone comes with a 5.5-Inch Samsung super AMOLED display. It brings forth HD resolutions that let you enjoy all your favorite films and games in crisp color and stunning detail. The large display barely features any bezels. Thanks to this, it truly enhances your media experience and lets you enjoy full-sized visuals like never before. The phone comes with 64GB internal storage and a 128GB SD card slot. This leaves you with enough storage for all your files and media. All of which can be enjoyed throughout the day on your phone’s stunning display. A powerful 3380mAh battery brings along up to 8 hours of continuous usage time. Whenever needed, you’ll be able to recharge your phone again in the blink of an eye thanks to quick-charge support. With the Doogee Mix Android phone at your side, you’ll never have to worry about running out of juice. In order to keep you connected at all times, your Android smartphone treats you to Dual-IMEI numbers, 4G, and Dual-Band WiFi. You’ll able to browse the web and stay within reach to friends and family no matter where you’re at. This latest Android phone comes equipped with the Helio P25 processor. As an Octa-Core CPU that has been clocked at 1.69GZ, it treats you to a remarkably powerful yet energy efficient user experience. Along with the phone’s 4G DDR3 RAM and Android 7.0 OS, you can tackle the latest software without experiencing any lag. Whether you’re into games, movies, or Apps – nothing will stop this phone. At the rear of the Android smartphone, you’ll find a stunning 16mp Dual-Lens camera. This snapper has been equipped with a Samsung ISOCELL sensor. This means that it lets you shoot truly breathtaking photographs and 4K video at any time of the day. From now on, not a single special moment in life will pass by without you snapping the perfect picture. The Doogee Mix Android Smartphone comes with a 12 months warranty, brought to you by the leader in electronic devices as well as wholesale cell phones.. This mobile was a gift to one of my teenager sons.